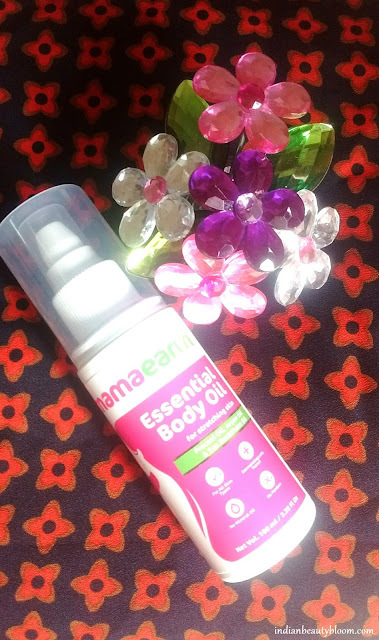 Today I going to review a new product from famous brand Mama Earth , It’s Essential Body Oil for Mama . Mama Earth being a renowned brand in Indian market have come up with many excellent products for Kids & Mama’s and I have reviewed many of them , one the best products like Mama Earth Argan Hair Mask and Mama Earth C3 face Mask have become very popular . 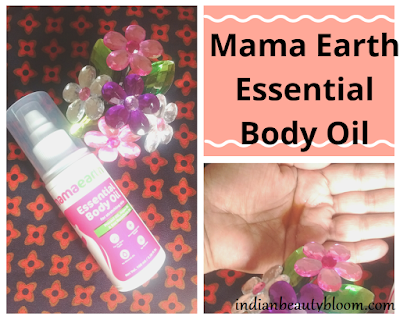 Got a chance to try & review this new launch from Mama Earth , it’s Essential Body Oil for Stretching Skins . USP of this Product is Pracaxi Oil also known as Miracle Oil which is used to cure skin problems like Scars , Stretch marks etc . Mama Earth Essential Body Oil is a dermatologically tested oil with goodness of Argan Oil , Pracaxi Oil , Sea buckthorn . It’s a paraben free product so safe for skin and suitable for all skin type . Argan Oil , Sea Buckthorn , Olive Oil , Jojoba Oil , Pracaxi Oil , Rose Hip Oil , Green tea oil , Vitamin E .
Price : Rs 499 for 100 ml . Oil is golden in color with a bit strong fragrance , but that’s not overpowering . 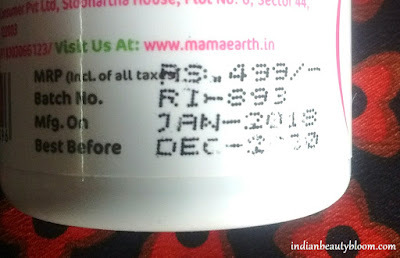 Product Packaging is good , similar like other Mama earth products . 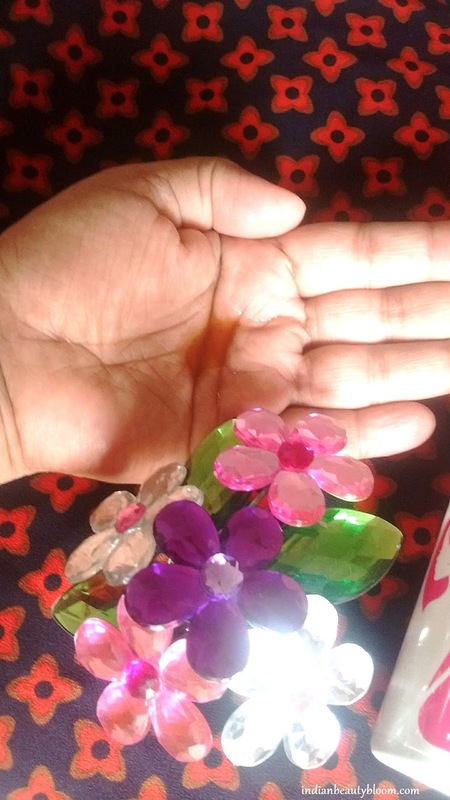 A cute white & Pink bottle of good quality plastic with a nozzle at the top from which little amount of oil can be easily taken out . 1. Paraben , SLS , Phthalates Free . 2. Mineral Oil Free . 3. Free of artificial fragrance and Dyes . 4. Has excellent ingredients list . 5. Has goodness of Olive oil , Argan Oil , Rose Hip Oil etc . 6. Moisturizes the skin and reduces itchiness . 7. Regular usage helps to reduce stretch marks . 8. Excellent product packaging . 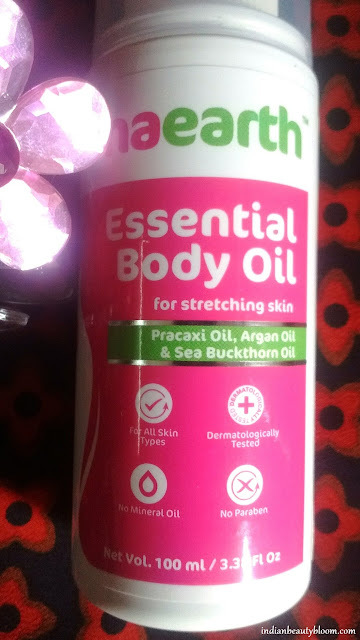 Pregnant Woman needs to apply this from the Second Trimester to stretch mark prone areas like abdomen , lower back , hip and thighs , twice daily . New mom’s and others can also apply this oil twice daily to reduce stretch marks . One needs to apply this in circular motion to affected areas . I do have some pregnancy stretch marks on my tummy . I have started using this oil past few days . It’s moisturizing and gets absorbed in the skin completely . Makes skin soft & supple . Hope you all liked this post and found it useful , Do share your views if you have used this oil .